John Roberts is sworn in as Chief Justice by senior Associate Justice John Paul Stevens in the East Room of the White House on the same day as his confirmation, September 29, 2005. 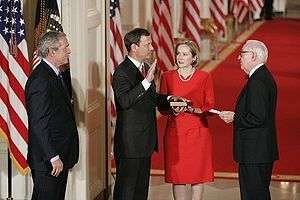 Samuel Alito is sworn in as an Associate Justice by Chief Justice John Roberts in the East Room of the White House on the day after his confirmation, February 1, 2006. Speculation abounded over potential nominations to the Supreme Court of the United States by President George W. Bush since before his presidency. In the summer of 2005, this speculation became newsworthy due to the announcement of the retirement of Associate Justice Sandra Day O'Connor on July 1. President Bush announced federal appellate judge John Roberts as O'Connor's replacement on July 19. On September 5, two days after the death of Chief Justice William Rehnquist, Bush renominated Roberts as the 17th Chief Justice of the United States. 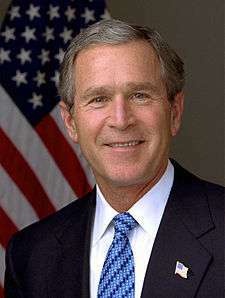 He was confirmed by the United States Senate on September 29, 2005. 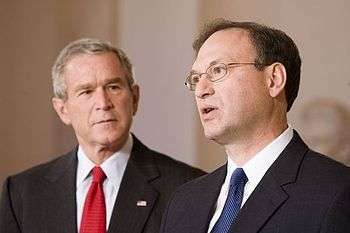 On October 31, Bush nominated another federal appellate judge, Samuel Alito, as his new choice to replace O'Connor. Alito was confirmed as the 110th Justice of the Supreme Court on January 31, 2006. Throughout much of the history of the United States, the Supreme Court of the United States was clearly the least powerful branch of the government, and nominations to that body, although important, were not the source of great political controversy as they are today. Until the death of Chief Justice Rehnquist in 2005, the composition of the Supreme Court had remained unchanged since 1994, the second longest time period without a membership change in U.S. history (the longest having been from 1812–1823). Furthermore, the current court has been sharply divided on a number of high-profile issues, including abortion rights, affirmative action, the extent of Congressional power under the Commerce Clause, eminent domain, gay rights, the separation of church and state under the Establishment Clause, sovereign immunity, and states' rights. The number of close votes in cases involving these areas suggests that a change of one or two key justices could completely shift the thinking of the Court on such issues. When asked about the kind of justices he would appoint to the Supreme Court, President George W. Bush responded: "I would pick people that would be strict constructionists. We've got plenty of lawmakers in Washington, D.C. Legislators make law. Judges interpret the Constitution. ... And that's the kind of judge I'm going to put on there." In more detail, Bush in 1999 told reporter Fred Barnes of the conservative magazine The Weekly Standard that he would nominate judges to the court in the mold of originalist Justice Antonin Scalia. Soon after the inauguration of Bush as president in January 2001, many liberal academics became worried that he would begin packing the federal judiciary with conservative jurists. Yale law professor Bruce Ackerman wrote an article in the February 2001 edition of the liberal magazine The American Prospect that encouraged the use of the filibuster to stop Bush from placing any nominee on the Supreme Court during his first term. In addition, law professors Cass Sunstein (University of Chicago) and Laurence Tribe (Harvard), along with Marcia Greenberger of the National Women's Law Center, counseled Senate Democrats in April 2001 "to scrutinize judicial nominees more closely than ever." Specifically, they said, "there was no obligation to confirm someone just because they are scholarly or erudite." On May 9, 2001, President Bush announced his first eleven court of appeals nominees in a special White House ceremony. There was immediate concern expressed by Senate Democrats and liberal groups like the Alliance for Justice. Democratic Senator Charles E. Schumer of New York said that the White House was "trying to create the most ideological bench in the history of the nation." From June 2001 to January 2003, when the Senate was controlled by the Democrats, the most conservative appellate nominees were stalled in the Senate Judiciary Committee and never given hearings or committee votes. However, after the 2002 mid-term elections in which the Republicans regained control of the Senate by a 51-49 margin, these same nominees began to be moved through the now Republican-controlled Senate Judiciary Committee. With no other way to block confirmation, the Senate Democrats started to filibuster judicial nominees. On February 12, 2003, Miguel Estrada, a nominee for the D.C. Circuit, became the first court of appeals nominee ever to be filibustered. Later, nine other conservative court of appeals nominees were also filibustered. These nine were Priscilla Owen, Charles W. Pickering, Carolyn Kuhl, David W. McKeague, Henry Saad, Richard Allen Griffin, William H. Pryor, William Gerry Myers III and Janice Rogers Brown. Three of the nominees (Estrada, Pickering and Kuhl) withdrew their nominations before the end of the 108th Congress. As a result of these ten filibusters, Senate Republicans began to threaten to change the existing Senate rules by using what Senator Trent Lott termed the "nuclear option". This change in rules would eliminate the use of the filibuster to prevent judicial confirmation votes. However, with only a two-vote majority, the Republicans were in a weak position to implement this procedural maneuver. Things changed in 2005 due to the 2004 elections. With President Bush winning re-election by a narrow margin and the Republicans picking up further Senate seats (55-45) in the 109th Congress, the "nuclear option" became a more viable strategy to ensure confirmation. On May 24, 2005, seven moderate senators of each party, called the Gang of 14, in a deal to avoid the use of the "nuclear option", agreed to drop the filibuster against three of the seven remaining affected court of appeals nominees (Priscilla Owen, Janice Rogers Brown, and William Pryor) but not two others (Henry Saad and William Myers). In addition, the senators in the group agreed to block future judicial filibusters except in cases involving "extraordinary circumstances". As a direct result of the deal, the two filibustered nominees not mentioned in it (David W. McKeague and Richard Allen Griffin) were confirmed. Despite these agreements, however, some observers noted that the chances were still high that the Democrats would filibuster any of the ten originally filibustered nominees if he or she were later nominated to the Supreme Court, especially Owen, Pryor or Brown. Although there has been a long history of Supreme Court nominees being rejected, only one Supreme Court nominee has ever been filibustered. In 1968, Chief Justice nominee Abe Fortas was filibustered and withdrew after a short period. During the summer of 2005, it was assumed that the Democrats would filibuster any Supreme Court nominee who would change the ideological composition of the court. Initially, this conjecture seemed to be borne out when conservative jurist John Roberts was renominated to replace conservative Chief Justice Rehnquist. The confirmation process went relatively smoothly with no threat of a filibuster. Later, however, the hypothesis was disproved. When Bush chose another conservative appellate judge, Samuel Alito, to replace moderate Justice Sandra Day O'Connor, opponents of Alito could not generate enough votes to prevent cloture from being invoked on his nomination. Very soon afterward, he was successfully confirmed. As the 2004–2005 term of the Supreme Court ended, there was a flurry of rumors that Rehnquist, who was undergoing treatment for thyroid cancer, would soon retire. On June 27, 2005, Senate Minority Leader Harry Reid (D-Nevada) suggested that the next appointment to the Court should come from outside the judiciary. Reid suggested the appointment of one of four Republican Senators, none of whom possessed previous judicial experience: Mel Martinez of Florida, Mike DeWine of Ohio, Mike Crapo of Idaho and Lindsey Graham of South Carolina. The list did not include the name of Republican Senator John Cornyn of Texas, a former justice on the Texas Supreme Court. Reid declined to address the omission. Unexpectedly, on July 1, 2005, it was not Rehnquist who announced his retirement, but O'Connor. On July 12, Bush met at the White House with the party leaders and ranking Judiciary Committee members from the two major parties — Republicans Bill Frist and Arlen Specter, and Democrats Reid and Patrick Leahy — to discuss the nomination process. During the meeting, the Democrats offered the President the names of three "moderate" Hispanic federal judges that they could accept: Sonia Sotomayor of the Second Circuit, Edward Prado of the Fifth Circuit, and Ricardo Hinojosa, a district court judge from Texas. Reid later told the press he was disappointed that the President had not chosen to discuss his own choice of possible candidates with the Democrats. In the conservative magazine National Review, the three candidates suggested by the Democrats were quickly dismissed as being offered in bad faith because they were too liberal for a conservative president to seriously consider. Judge Sotomayor was later nominated to the Supreme Court by Democratic President Barack Obama and confirmed as an Associate Justice in 2009. On the same day as the meeting with the President, First Lady Laura Bush announced in an interview during an official visit to Africa a preference for her husband to nominate a woman to O'Connor's seat. Bush was surprised at his wife's public comments on the Supreme Court, but said he would be open to hearing her advice when she returned from her trip. 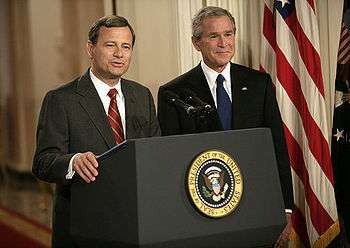 John Roberts, now Chief Justice, is pictured here with President Bush at the announcement of his first nomination on July 19, 2005. On the evening of July 19, 2005, Bush announced his first Supreme Court nominee, John G. Roberts, Jr., a highly regarded former Supreme Court litigator and conservative judge on the D.C. Circuit Court of Appeals. During the day leading up to the announcement, there had been much media speculation that one of either two female judges on the Fifth Circuit would get the nod: moderate Edith Brown Clement or conservative Edith H. Jones. Clement was considered the frontrunner. About an hour before the televised announcement, however, information was leaked to the press concerning the choice of Roberts. On September 3, 2005, Rehnquist died. Two days later, on the morning of September 5, Bush announced that he would switch Roberts' nomination and instead nominate him for the newly vacant post of Chief Justice of the United States, once again leaving O'Connor's vacancy without a replacement nominee. On September 6, Specter encouraged the President to fill O'Connor's position with a woman, saying that the Supreme Court should have a minimum of two female justices. On September 9, Laura Bush reiterated her previous wish to also see a female nominee. On the Thursday before Roberts' confirmation hearing, one of Reid's aides said that the nomination of several candidates said to be on the President's short list to replace O'Connor — conservative appellate Judges J. Michael Luttig, Emilio Garza and Edith Jones — would be unacceptable to the Democrats, implying that any of them would be filibustered. Several days later, Specter made it known that he felt that it was too early for Bush to elevate Attorney General Alberto Gonzales to the Supreme Court. Roberts' confirmation hearing for Chief Justice was held from Monday, September 12, to Friday, September 16. During the week of the hearing, there was much talk that Priscilla Owen would be the next nominee, but columnist Robert Novak reported that by Friday, Reid had told Frist that Judge Owen would also be filibustered if chosen. On Wednesday, September 21, Bush had another meeting with Senators Frist, Specter, Reid and Leahy to discuss possible Supreme Court nominations. On the day before, Laura Bush mentioned publicly for the third time that she would like to see a female nominee. At the same time, Reid stated that the nomination of any of the previously filibustered appellate nominees would be viewed by the Democrats as "a poke in the eye with a sharp stick". He restated this position during the meeting with the President when he warned against nominating either Brown or Owen. Again, Reid and Leahy offered the names of appeals court Judges Sonia Sotomayor and Ed Prado and district court Judge Ricardo Hinojosa. Again, Bush did not offer any names of his own to discuss. On Thursday, September 22, Roberts' nomination was voted out of the Senate Judiciary Committee by a bipartisan vote of 13-5. During a press conference on Monday, September 26, Bush implied that his next nominee would be either a woman or a minority. In making his decision concerning O'Connor's replacement, he said he would keep in mind that, "diversity is one of the strengths of the country". John Roberts was confirmed by the United States Senate on Thursday, September 29, by a vote of 78-22 and was sworn in both privately and publicly later the same day. During the evening of Sunday, October 2, John Fund, a columnist for the Wall Street Journal, announced on the radio show of blogger Matt Drudge that his sources had told him that the nominee would be moderate Hispanic Judge Consuelo M. Callahan of the Ninth Circuit. The website ConfirmThem.com, however, reported on the same evening that the selection had been made in favor of conservative Fourth Circuit Judge Karen J. Williams. On Monday, October 3, President Bush unexpectedly chose little-known White House Counsel Harriet Miers to be O'Connor's replacement on the court. President Bush introducing withdrawn nominee Harriet Miers. That her credentials under objective standards were not sufficient to qualify her for the position. That her nomination was the result of political cronyism. Because her legal career did not compare to those of other possible conservative female candidates (like federal appellate judges Edith Jones, Karen J. Williams, Priscilla Owen, and Janice Rogers Brown), many thought that President Bush probably nominated Miers for her personal loyalty to him rather than for her qualifications. That there was no written record to demonstrate that she was either a strict constructionist or originalist in her approach to constitutional interpretation. Some conservatives feared that she would support abortion rights, affirmative action and gay rights if ever confirmed to a seat on the Supreme Court. On the morning of Thursday, October 27, 2005, President Bush "reluctantly" accepted Miers's request to withdraw her nomination. Associate Justice Samuel Alito acknowledges his nomination on October 31, 2005, with President Bush looking on. Bush moved quickly to find an alternative nominee to Miers, a nominee who would have both the credentials that Miers lacked and a conservative judicial philosophy that could be well documented. On the morning of Monday, October 31, Bush announced the nomination of well-known conservative Judge Samuel A. Alito, Jr., a fifteen-year veteran of the Third Circuit Court of Appeals. Alito's confirmation hearing was held from Monday, January 9, 2006, to Friday, January 13. On Tuesday, January 24, his nomination was voted out of the Senate Judiciary Committee on a 10-8 party line vote. Debate on the nomination began in the full Senate on Wednesday, January 25. Despite a last minute effort by Democratic Senator John Kerry to filibuster, which was joined by, among others, Sens. Barack Obama, Joseph Biden, Hillary Clinton, Charles Schumer, and Harry Reid, a cloture vote to end debate passed 72-25 on Monday, January 30. On the morning of Tuesday, January 31, Alito was confirmed to the Supreme Court by a vote of 58-42. He was sworn in privately later that same day. The next day, he was publicly sworn in. At the end of the 109th Congress, the Gang of 14 deal expired. On November 7, 2006, the Democrats retook control in the 110th Congress. Starting in January 2007, they possessed a 51-49 majority in the Senate. As the new Senate majority, the Democrats easily blocked several conservative appellate judicial nominees without resorting to the filibuster. Conservative appellate nominees like Peter Keisler, Robert J. Conrad and Steve A. Matthews were blocked in committee and never given a hearing. If a Supreme Court justice had chosen to retire during the 110th Congress, it would have been easy for the Democrats to have blocked his proposed replacement in committee, or even by a party-line vote on the Senate floor, if it somehow came to that. As it developed, no Supreme Court justice retired or died during the 110th Congress. 1 2 U.S. Senate Roll Call Votes - Nomination of John Roberts, senate.gov. ↑ U.S. Senate Roll Call Votes - Nomination of Samuel Alito, senate.gov. ↑ The Weekly Standard: BUSH SCALIA July 5, 1999. ↑ Ackerman, Bruce. The Court Packs Itself, The American Prospect, Feb 21, 2001. ↑ Washington Talk: Democrats Readying for Judicial Fight, The New York Times, May 1, 2001. ↑ President Bush Announces Federal Judicial Appointees, May 9, 2001. ↑ No Rush to Judges, The Nation, May 17, 2001. ↑ Judicial Selection During the Bush Administration, Alliance for Justice, 2008. ↑ Lewis, Neil A. Bush to Nominate 11 to Judgeships Today, The New York Times, May 9, 2001. ↑ Gaziano, Todd F. A Diminished Judiciary: The Causes and Effects of the Sustained High Vacancy Rates in the Federal Courts, The Heritage Foundation, Oct 10, 2002. ↑ Threadgill, Susan. Who's Who, The Washington Monthly, March, 2003. ↑ Failed Cloture Votes on President Bush’s Nominees, abanet.org. ↑ Senators compromise on filibusters, CNN, May 24, 2005. 1 2 3 4 Supreme Court Justice O'Connor retiring, MSNBC, 2005. ↑ Lopez, Kathryn Jean. Kiss of Death, National Review, June 28, 2005. 1 2 3 4 Lott, John R. Jr, and Jones, Sonya D. Unserious Suggestions, National Review, July 19, 2005. 1 2 3 4 5 6 7 8 9 10 11 12 13 14 15 Riechmann, Deb. Bush to announce Supreme Court nominee in prime-time TV appearance , The San Diego Union-Tribune, July 19, 2005. 1 2 3 4 5 6 Source: Clement Not Bush's Choice for High Court, ABC News, July 19, 2009. 1 2 3 4 5 6 7 8 9 10 11 12 13 14 15 Bush Picks Roberts for Supreme Court, Fox News, July 20, 2005. 1 2 3 4 5 6 Baker, Peter, and Becker, Jo. Bush Pledges Wide Search for Court Seat, The Washington Post, Sept 7, 2005. 1 2 3 4 5 6 7 8 9 Kirkpatrick, David D. Senate Democrats Are Shifting Focus From Roberts to Other Seat, The New York Times, Sept 9, 2005. 1 2 Specter: Gonzales Not Ready for Supreme Court, Capitol Hill Blue, Sept 12, 2005. ↑ Reid Warns of Filibuster Over Owen, politicalwire.com, Sept 17, 2005. 1 2 3 4 5 6 7 8 9 10 11 12 13 14 15 16 17 Kiely, Kathy. Roberts picks up Democratic support in Senate, USA Today, Sept 21, 2005. 1 2 3 4 5 Judiciary Panel Approves Roberts, Fox News, Sept 22, 2005. 1 2 Bush picks White House counsel for Supreme Court, CNN, Oct 4, 2005. ↑ GOP sets up showdown over Alito, CNN, Jan. 27, 2006. 1 2 3 4 5 6 7 8 9 10 11 12 13 14 15 16 17 18 Possible Miers replacements, USA Today, Oct 27, 2005. 1 2 3 Greenburg, Jan Crawford. Women, Minorities Top Bush's Supreme Court Short List, ABC News, July 1, 2007. ↑ Walker, Jessica M. Fla. Justice Gets Backing for U.S. Supreme Court Seat, law.com, July 7, 2005. ↑ Couch, Mark P. State justice touted as nominee, The Denver Post, July 12, 2005.